We are now mobile device friendly, and you can now purchase your Mexican auto insurance policy from any mobile device, then save a digital copy to your device. All of our Mexican insurance companies have confirmed that digital copies of your Mexican insurance policy are now accepted by the claims adjusters authorities in Mexico. You can still Purchase & Print a hardcopy version of your Mexican auto insurance policy instantly from any computer or device that is connected to a printer. You can also purchase your policy now, then print a copy of your policy later. You can save a copy of your policy as a PDF file, or you can login to your account 24/7 to access and re-print your policy at any time. Compare rates from multiple Mexican insurance companies & save! After many years in the Mexico insurance industry, we have chosen to partner with four Mexican insurance companies because of their professionalism, customer friendly service, financial strength, and quality insurance products. Our online quoting system provides insurance quotes from all four companies, allowing you to quickly compare rates and coverage so you can easily choose the best price and coverage. Adventure Mexican Insurance is dedicated to providing the highest quality Mexican insurance to our customers in order to make your Mexico experience as smooth as possible. Our goal is to provide the quickest and easiest online system for purchasing and printing your Mexican insurance so you can relax and concentrate on having fun in Mexico! Take the stress out of driving to Mexico. Learn what you need before you start your car. Official digital copies — no need to print! Claims paid in US Dollars — not pesos! Medical Evacuation and Travel Assistance is included without adding extra coverage. Legal Assistance & Road Assistance automatically included. 24/7 Claims help call center. 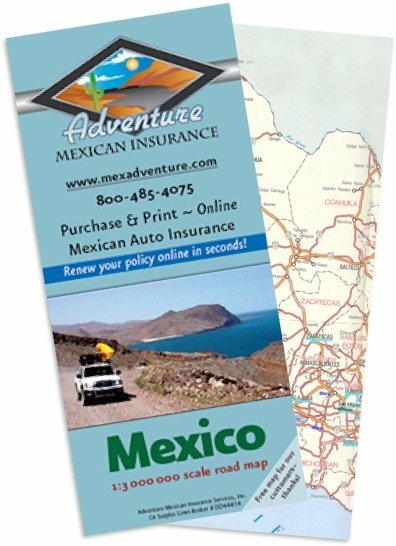 Free Map of Mexico when you purchase a policy. We are a California based specialty insurance broker who is fully licensed to sell Mexican insurance in the United States. Our Mexican insurance is underwritten by the best insurance companies in Mexico. We provide service for customers across the United Sates, in Canada, and ex pats who currently live in Mexico. As a courtesy to our customers, you can check our licenses on the Departments of Insurance for most states in the US. Please contact us if you would like additional information on our insurance license status in your state. We are a California based specialty insurance broker who is fully licensed to sell Mexican insurance in the United States and Canada. Our Mexican insurance is underwritten by the best insurance companies in Mexico. Looking for more information? Check out our licenses or chat with an agent.